U.S. Policy, Archives, Human Rights and Justice in the Southern Tip of the Western Hemisphere. Working with partners in Argentina, Uruguay, and Paraguay, the Southern Cone Documentation Project aims to support the effort for truth and justice and to address human rights violations committed by military regimes in the region in the 1970s and 1980s. Using U.S. declassified documents and records from regional secret services, project Director Carlos Osorio has introduced critical evidence in multiple judicial proceedings including trials featuring Operation Condor and Operation Mexico (both in Argentina), and against Uruguayan former President Juan Maria Bordaberry. The project has pushed successfully for the declassification of more than 8,000 US documents in the 1990s and early 2000’s in an effort to fill the historical gaps left by policy makers and to portray a more complete image of Latin American dictators and the nature of their U.S. partnerships. We are currently supporting the declassification of thousands of additional documents, announced by the Obama Administration in March 2016. With this evidence the Southern Cone Project will continue to assist victims of human rights abuses by exposing new information regarding repressive military regimes in South America and the complex role of U.S. policy. 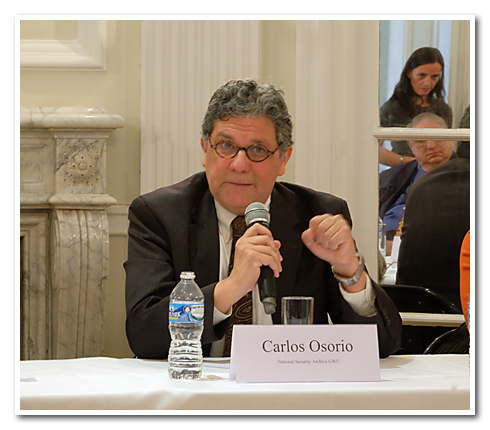 Carlos Osorio, Director of the National Security Archive's Southern Cone Documentation Project, receiving a special award from the Argentine Embassy in Washington for his work in providing critical documentary evidence and testimony to numerous high-profile trials in Argentina aimed at uncovering and prosecuting human rights violations by the military junta from 1976-1983. This Digital National Security Archive (DNSA) collection.makes available 2,429 selected, previously classified government documents chronicling the development of U.S. policy as it attempted to deal with the tragedy experienced in Argentina during the late 1970s. This critical, formative period featured a political collapse verging on civil war; a military coup; and tens of thousands of illegal detentions, torture and kidnappings.